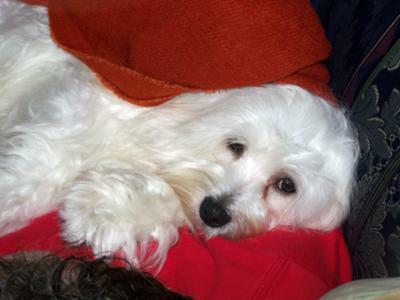 Kirby is our two year old Maltese Bichon and is a joy to take care of. He does not shed & is quite intelligent, and these traits convinced us to get him. He went through dog school with flying colors, and was house broken in a week. Our 13-year old son takes excellent care of him, combing his thick white hair, cleaning his eyes, trimming his nails, bathing him at least once a month, and walks him everyday. 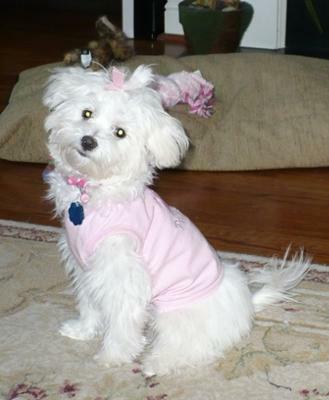 Our Maltese Bichon Isabella is just over a year old, weight 6lbs 3oz. She is very loving, was easy to potty train, she is all white. 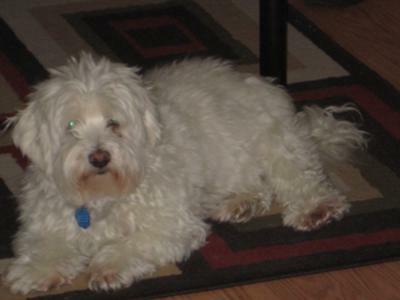 My Maltese Bichon mix was a gift to me after my last child moved out for college. She has one problem she likes to run after BIG dogs. We call it the little dog syndrome. My dog's name is Ginger. 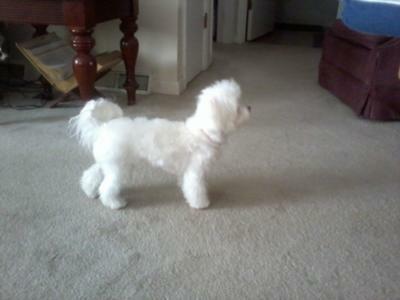 She is a Maltese Bichon that I got at the Boston Animal Shelter. 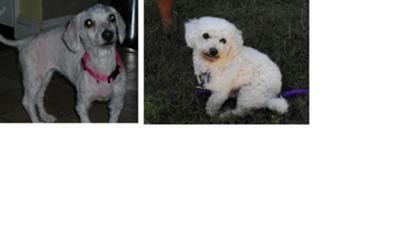 The picture show the how she looked when we got her and how she looks now. She had been abandoned and was found wandering the streets. They think she is about 5 years old. Her fur was badly matted which required the shelter to shave her. 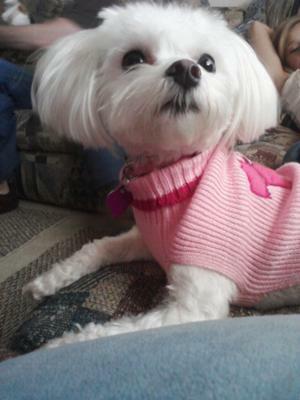 I have had my Bichon Maltese for about 6 months now and she is beautiful. She is so much fun, we go walking everyday, and she loves to play with her toys. She is very affectionate and sits on my lap and loves to be patted. She greets me at the door after work and is very excited when I get home. I never knew a dog could be so much fun!!! I have two cats which she gets along with and like to cuddle up and sleep with them. She also likes to play with any children that visit my home. She has been a great source of joy and happiness in my life, my husband an I don't know how we lived without her. We are very lucky to have our Maltese Bichon in our lives. Two Paws UP! for Ginger the rescue! Hi Ginger! 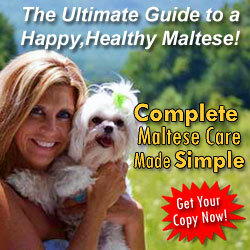 We are 2 Maltese dogs LuLu and LoLLy! We love rescue! We are so happy you found some humans to rescue! LoLLy is a rescue and she is AWESUM! WE love rescue so much we created the world's first doggy rock video called "Rescue Dog Rock!" Check it out at http://www.luluandlolly.com! Also, you look beautiful in your now pikture. Looks like you picked great humans! Your Maltese paLs, LuLu and LoLLy! Ginger is one lucky dog to be saved into such a loving environment and she is no doubt very appreciative to be there by all your comments. Sounds like Ginger & your family have a great future ahead. Enjoy. 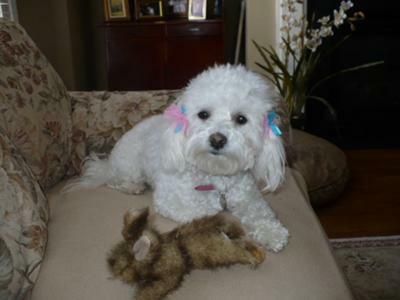 Our Maltese Bichon dog Trinket is 5 yrs. old. All in all she is a good girl. She is very territorial, but very good with kids. She has been the hardest to train. We blame it on the "blonde" hair. She forgets what she is suppose to do outside! Our Maltese Bichon has my husband wrapped around her little paw. I would love to know how you keep her face so pretty and white? Sh'es a doll! 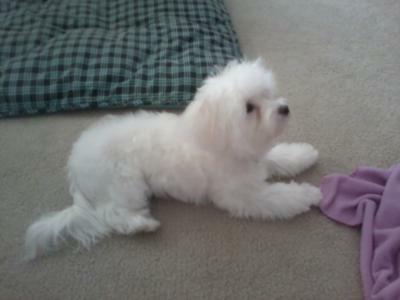 Our Maltese Bichon is a wonderful puppy. We got her for my 2 year old who is fighting leukemia. Hannah makes going through chemotherapy, Dr's appointments, shots and meds alot easier on my daughter. Since getting Hannah, my daughter has had a constant smile on her face. Hannah spends every minute loving and playing with my daughter. We love her so much. I was reading with interest "what an angel by Charlotte" - I agree with everything she said. You have two beautiful little treasures - hope you all keep well and happy. Oh what a absolutely sweet photo.i have a maltese and they are adorale sweet dogs, you made a good choice.and it put a smile on my face...the thought of this sweet little dog bringing your daughter smiles.I wish your daughter and family all the very best and may she have many,many,many happy days with Hannah. We just bought a Maltichon for our 7 year old daughter. The only thing she has wanted in the world was a dog. Reading your story makes me realize that maybe we made a good choice. We do not get the dog until Thanksgiving weekend. I think we made a good choice. Wishing your family all the very best. What an adorable photo!!! This is a photo to cherish always. Chloe is a wonderful dog. We got our Maltese Bichon puppy from a pet store and we have fallen in love with her. Our grandchildren "encouraged" us to get her and we are so happy that they did. We are having difficulty housebreaking her and she likes to "play bite" but is so cute and lovable!!! She is now almost 6 months old and 9 pounds. Don't know how big she will get or what her hair will look like. The groomer says she seems to have more Maltese like hair. Our Maltese Bichon mix loves kids and other dogs!!! Does not bark but rarely. Hi chloe! My name is anuggles and i jus wanted to let you know that your ABSOLUTLY ADORABLE! 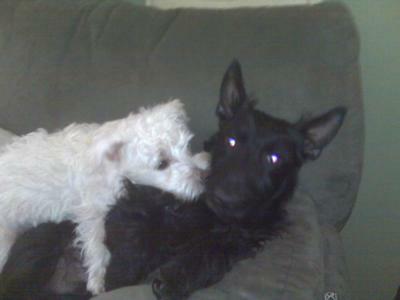 MY OWNER says u look exactly like me when i was a pup. we jus wanted to stop by and say ur a real cutie pa-tootie! Ruff! Two Paws UP! for Chloe! 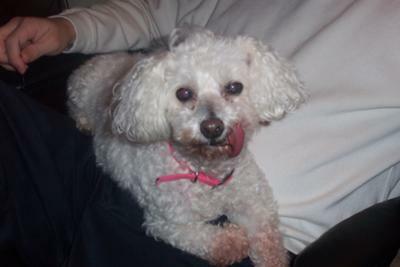 My Maltese Bichon Krissy came into my life 14 years ago on my best Valentines Day ever. I had met the man of my dreams. We just got married a few weeks before and my husband brought this adorable ball of white fur home as a gift for me. He worked nights in the military and he wanted me to have a dog that would keep me company and to also let me know if someone was coming. I was so surprised and a little nervous. I had never really had a dog before. There were a few when I was little, but they never stayed around for very long. Mom didn't really like animals in the house. Anyway, Krissy was everything David wanted for me and more. She was the most lovable dog I had ever seen. She loved everybody (except-and this may sound racist (sorry)- but she didn't like black people- my husband said it was probably because of the way dogs see- who knows). She was my love bug! Soon after we got Krissy my husband and I took our first cross country trip to Idaho. Of course I was going to take my dog! She quickly found her favorite spot...it was behind my husbands head while he was driving. She made a GREAT headrest! The trip was a great success. Krissy loved the car and her favorite part was the white water rafting! (Or maybe meeting the horses). Over the years Krissy traveled across country with us 5 times, lived in 11 different locations with us, had 3 beautiful puppies, shared in the joy of the birth of two of our boys and taught 2 other dogs how to stay in the yard (Chewy and Cocoa). She never snapped at anyone and was as happy as a clam if you would just rub her belly! She lost most of her teeth (all but 5) when she was about 7. So most people remember her best by her tongue hanging out the side of her mouth! I will always remember her just as "my baby girl". She was the best dog anyone could have EVER asked for! Her passing was actually pretty quick in the whole grand scheme of things. She was fine and then within 3 days she was gone. (We believe that she either had several strokes or something more serious like a cancer in the brain) After she died we brought her home and buried her by the hammock so that we could still have some of our great "talks". My family and I went to the local nursery and picked out just the right flowering bush to plant on top of her. (I can't remember the name of it but it blooms beautiful white flowers in the fall). If you have the great honor of owning one of these dogs it will be the best thing you have ever done! My girls name is Angel. She lived just 4yrs and 2 1/2 months. She had the best personallity. Lots of love to give and she sure did. She was truly a mommy's girl but loved her daddy too. She loved to play soccer and was good a kicking th ball to you. She would share my food with me and was completely spoiled. She spoiled me too! I know love, but her love was a very special different kind of love I have never felt before. I truly truly miss her. She got sick with RMSF, Rocky Mountain Spotted Fever, she got over that and the became partially paralized just days later. We went to a neorologist and they performed test that showed cancer in and around her spine & spinal cord and then the day after we got word we had to let her go accross the rainbow bridge to not suffer anymore. I am still grieving over the loss of Angel and feel so much guilt. I truly was blessed and now trying to decide if I should get another baby since I have so much love to offer and need it in return. My heart goes out to you and your family. Krissy was not only a beautiful dog, but she sound like a like she had a beautiful soul! I lost my pomerian over 7 years ago and I still tear up now and then thinking about my baby girl. 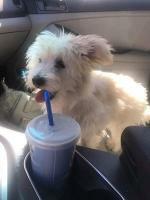 We recently rescued a maltese mix at the Humane Society. I believe she is Bichon mix, but others say she is a Multipoo. I have posted her picture and information on this site for her breed mix, advice on maintenance and care. Again, my heart goes out to you for the lost of your long time campanion. They do bring us joy they can never be replaced. It's ridiculous and small minded of you to post that your dog did not like Black people. Not only does it sound racist, it is racist. 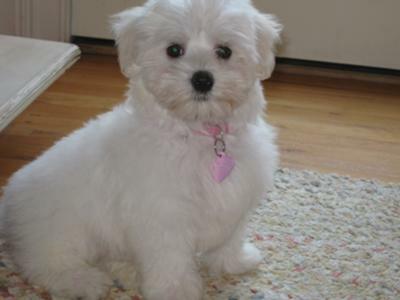 I am African-American and I have just purchased a Maltese Bichon and I will teach her to love all people. I started reviewing this website for tips on how to raise my pup and your post provides not helpful information, yet it includes racist remarks. Comments like that are very much a part of the problem with race relations in America. I'm sure glad that none of my white friends, or their dogs, see color and dislike me or other African Americans simply because of our skin color. I'm sorry you've lost your long-time friend, Krissy. I lost my last dog just over two years ago, so I know how you feel. My Chow Chow Tazz is also buried out in the backyard he loved so much. Well, her papers say she is a purebred Bichon, but we think she may be a Maltese Bichon. 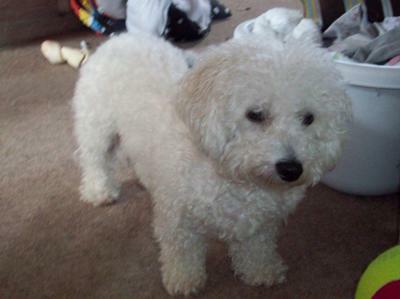 She has a silky coat and her tail is straight and has long silky fur, but her head is definitely Bichon. Please help. 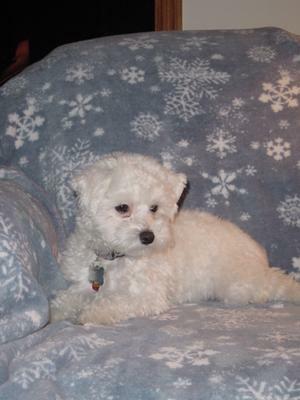 Lavender is a maltese bichon because my dog looks exactly like her and he's a maltese bichon. 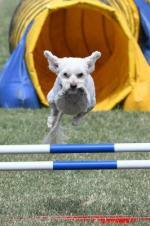 Our Maltese Bichon Bo is a very special dog. He is so smart (a little too smart at times), and he loves everyone he meets. He loves to lay in the sun in the mornings and when anyone gets the hairdryer out, he runs to squeaze his way into the stream of warm air. Before we bath our Bichon Maltese, we put two big fluffy towels in the dryer so when he's ready to get out he can be wrapped up in the warm towels. Then he gets cuddled in daddy's arms for about an hour as he sleeps in his cocoon of warmth, and afterwards gets dried, which he loves! I'm not sure, but we may be spoiling him a bit. Anyway, he is so mischievous, and is always clowning around and posing by laying on his back with all four feet in the air. And for some reason he loves to dig in the garden. He comes in with dirt all over his face with and looks at us like, "what are you looking at?". He really brings so much joy into our lives. The only thing that would make having him better is if he could be with us forever. But we're just going to enjoy our Maltese Bichon while he's here. Bogart looks just like my Yaya! I wasn't sure what he was but now I know, Yaya is Maltichon! He is 3 and cute as a button! Wishing you happy days ahead with your Maltichon too! Duffy always has to cuddle! Duffy is amazing! 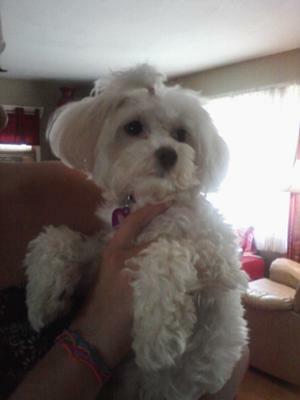 My Maltese Bichon has the best personality, very very friendly, and sometimes a little mischievous. He absolutely loves to cuddle with us or our other dog which is a Scottish Terrier (Grady). Duffy has a face that can melt you're heart and is a a joy to our house! Last time we took Duffy and Grady to the groomer, they were gone for a majority of the day... and the house just wasn't right. It felt empty and wasn't the same not having them following me around, every where I go! 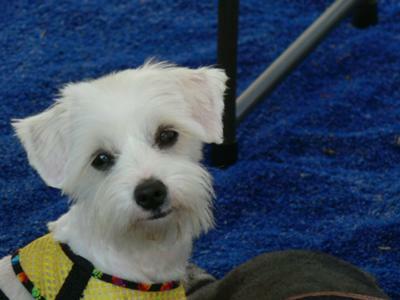 Awesome, caring, high energy and cute Maltese Bichon dog! Two Paws UP! for Duffy! 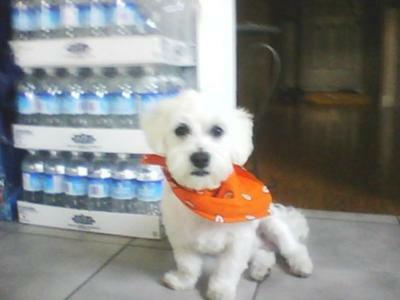 My Maltese Bichon is the best dog you could ask for. When I bought him I was told he was Maltese, but his hair is too curly. He NEVER Barks, NEVER Bites, and is only capable of loving you to death!!! Dexter is the cutest and he sits just like Maddyson! Two Paws UP! for Dexter! Hi Dexter! We are 2 Maltese dogs LuLu and LoLLy! We love your pikture and think you are adorable! You look super fluffy! Also, We wanted to give you Two Paws UP! for your great post! Also, have you heard about our health care reform? If not, you should check it out at http://www.luluandlolly.com! We need more dogs to sign out pet-tition! Your Maltese paLs, LuLu and LoLLy! Our little love is a Maltese Bichon rescue. We've only had her for 12 days but she is so sweet it's hard for us to understand why anyone would let her out of their site. She looks like a Bichon with the silky white hair of a Maltese. The picture is after having to have all her hair cut off due to mats, burrs and filth. She was on the run for approx. 2 months before we were able to catch her. Thank GOD she is healthy otherwise. Right now she's afraid of alot of things but we are hoping with time she will forget her ordeal and begin to trust again. I am looking to adopt a maltichon. I live in a suburb of Chicago. It seems difficult to locate any in my area. Hi, I just got a maltichon two days ago, I though she was a Bichon, but Petco said she was a mix. She was given away 3 times I think, and abused somewhere in there. She just shook when I first got her and I held her and talked to her and now she is a little better. My renters had her and she is ten years old and they gave her up for a pitbull. She hardly has any teeth, her hair is thin, her face is stained brown and yet she is so sweet. I cannot believe she would be left once, let alone several times. I have always loved big dogs, but this little girl has stolen my heart. I am divorced and am really loving this affectionate little creature. I have started her on some healthy dog food, her hair is very short but looks better already, I bought some gentle shampoo, and tear wash, so we can get her looking like her sweet self. I have never understood how people could dress their dogs, but I am already looking at cute things for her. I will give her the quality of life she deserves. 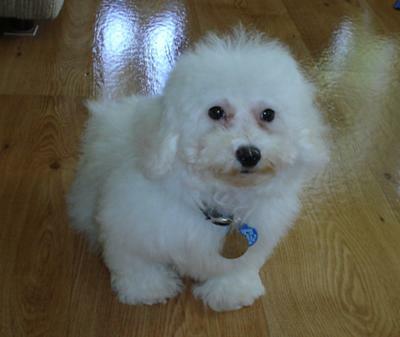 I too have a Maltese Bichon Reascue who was said to have been wandering the streets of Orlando. When I got her she was completly bald.. but now, 2 years later, she is my spoiled little princess. I always wondered why someone would abandon such a sweet little girl! Now your Crystal is the second one that I know of.. all I can question is why?? But then again, I thank God daily that he put her in my life. She has been a true blessing! This is our 6 year old Maltese Bichon, Stax. He was born April 17th 2005. He is a very affectionate dog. We have had him since he was 9 weeks old. 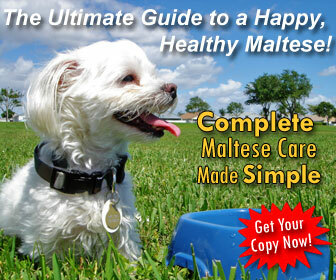 Our Maltese Bichon mix is so special, he is incredibly funny and is always searching for a little scratch on the back. Although he hates walks, he loves to go crazy sometimes. We love him so much! Libby will be 2 years old July 2011. We got our Maltese Bichon at 13 weeks and life hasn't been the same since. First, she stole our hearts and she's had it ever since. Libby was very intelligent and easy to housebreak. I think with these dogs the important thing in training and housebreaking is keeping a consistent schedule. That is, taking them out at the same times everyday so they know what to expect. I don't know about all Maltichons but Libby knows very well how to communicate without saying a word. She definitely lets me know when she wants something or when she is unahppy with me. For example, I left her with my daughter a week while away working out of town. When I returned, I thought she would be so happy to see me. She demonstrated that she was very unahppy with me for leaving her and it took a couple of days for her to get over it. She definitely has feelings and she wants me to know what they are. She never goes up or down the stairs without taking along a favorite toy. Usually, she will fall asleep with her chin on the toy. Now, if I could get her barking under control, life will be perfect. Actually, the barking has gotten better, but she is vocal and wants to "talk" with everyone and every dog she sees. I think she is saying "look at me how cute I am" or something like that. Wishing you the best of luck finding a dog that's perfect for you! Please let me know if you ever need any more help.